Ensure they have the items needed in order to move successfully through their divorce. Be proactive in their role through their divorce. Don't let others control the process. Locate and review documents before they are required. 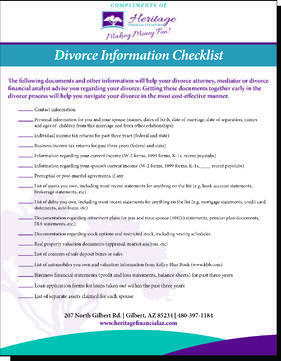 Download the Divorce Checklist TODAY! It contains valuable take-aways on items which NEED to be considered and be prepared with in order to get through divorce financially secure. During a divorce it is important to be proactive in ensuring you are doing all you can to protect what's yours, so you can confidently move towards the next chapter of your life!